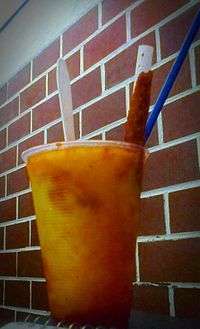 A mango chamoyada with a tamarind straw. Chamoyada is a sweet and spicy type of shaved ice, or raspado, prepared with chamoy. It is a part of Mexican cuisine, and is also common in regions of the United States with significant Mexican-American populations. The drink is usually sweetened with mangoes or apricots. It is essentially a combination of chamoy sauce, shaved ice, chili powder, and fruit chunks. In certain variations, a whole fruit popsicle, or paleta, is added to the drink and mixed with the shaved ice. The drinking straws served with chamoyadas also often have tamarind candy on the outside. Chamoyadas do not contain any dairy products. The different flavors of chamoyadas can include fruits like mango, lemon, guava, tamarind, pineapple and strawberry. ↑ Deborah M. Schneider (13 June 2006). ¡Baja! Cooking on the Edge. Rodale. p. 21. ISBN 978-1-59486-203-8. ↑ Marum, Anna. "Ome Calli, a Mexican ice cream parlor, offers its famous chamoyadas at new Beaverton shop". The Oregonian. Retrieved 27 October 2015. Wikimedia Commons has media related to Chamoyada.